This past sunny and hot Friday was nothing but fun. It was my birthday and I couldn't have spent it better anywhere else but Carson beach with the BASE kids. The morning started with some arts and crafts, soccer, and football. I was doing arts and crafts with a few girls from the BASE camp. They were pretty engaging and really smart young girls. As they sat next to me coloring and drawing the different types of sea animals, Cynthia and I got engaged in a conversation. We became best friends for the entire day. So Cynthia and I started talking about birthdays and she was telling me how her birthday was July 26th and I told her that my birthday was July 31st. 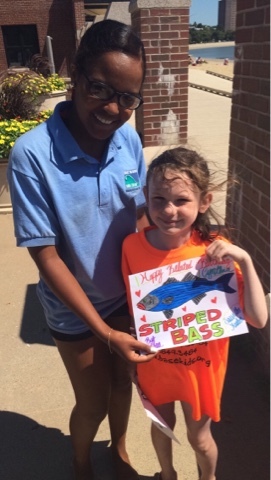 As a gift from me to her, I colored a striped Bass and decorated the entire sheet for her. As we move on to a massive game of soccer, Cynthia wanted to be on my team so I couldn't resist not having her play with me. She did a pretty good job being the goal keeper even though we lost. After the soccer game, she told me that she wanted to go kayaking with me but she couldn't because she had to go get lunch with her group. I went kayaking by myself after teaching the YMCA kids how to cast a rod. 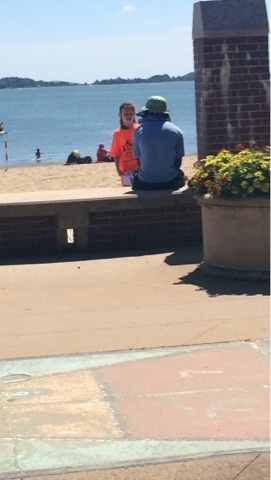 As I was returning from kayaking, guess who I see? Well it was Cynthia! She was kayaking with her friend and she told me to go stay next to them to help push them because the pedals were too big and she was so tiny. Spending the day with Cynthia and Carson doing different types of activities really made my birthday worth spending it there. She is a really bright little girl who acts and talks much like a grown up. If I could replay Friday with her, I definitely would.